Gone are the days of plastic trays and mystery meat Mondays, of limited choices and uninspired institutional fare. Today’s college campus is a place where reusable to-go containers and water stations are as commonplace as the soda and slushie machines of yesteryear; where food preparation is an art; and where food service providers take everything from taste and health to ethics and sustainability into consideration when choosing, preparing, and serving food to thousands of students each day. 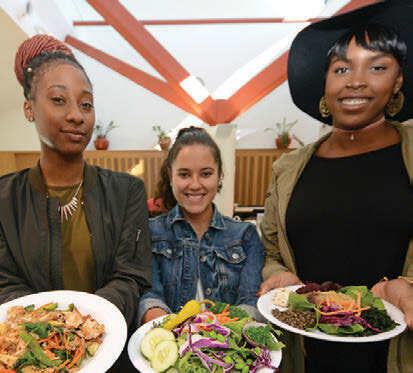 At Wesleyan, dining means farm to table, sustainability, and a variety of healthy meal options prepared for a generation of food-savvy students. From international cuisines to local food sourcing, from customizable choices to vegan and vegetarian fare, from meals on the run to all-day breakfast, on-campus food options are plentiful at Wesleyan. AHEAD OF THE CURVE. Wesleyan students are ahead of the curve in campus cuisine, leading the way on many national food trends in higher education, including local purchasing, responsible sourcing, and sustainable practices, as well as customizable food options that give students more flexibility. THINK GLOBAL. 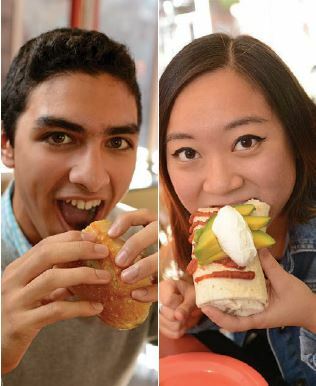 The growing interest in global cuisines on campus at Wesleyan can be linked to several factors, including both the increase in the university’s international student population and the explosive growth of foodie culture in general. 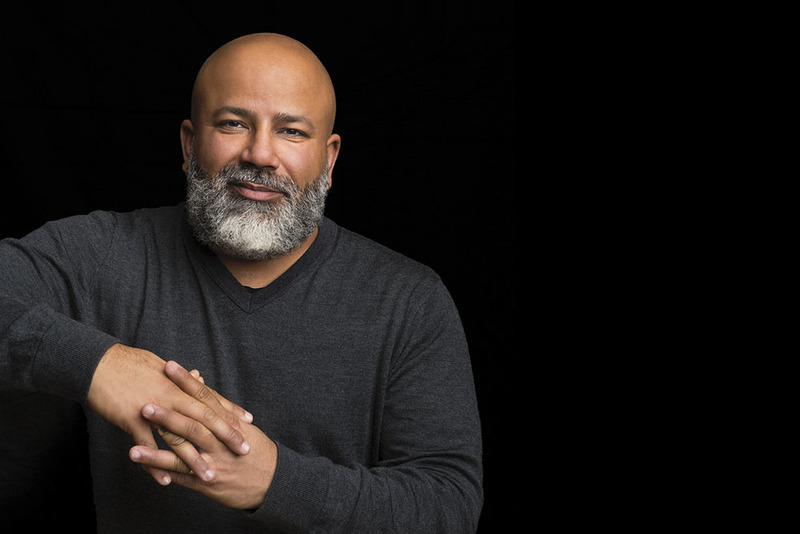 “Because of the Food Network and travel-food show hosts like Anthony Bourdain, plus social media, I think students are just more aware and interested in international flavors and cuisines,” says Strumpf. Today’s students not only consume their food, they blog about it, take pictures of it, and share their views on it, while consuming a steady diet of food-focused content produced by others. EAT LOCAL. One of the first changes Bon Appétit instituted at Wesleyan in 2007 was a from-scratch cooking program using local, seasonal ingredients. 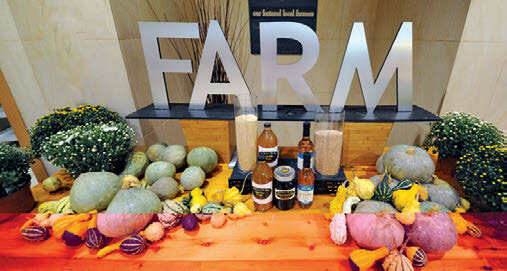 That change led to one of Bon Appétit and Wesleyan’s biggest joint successes so far: increasing local food sourcing through Bon Appétit’s Farm to Fork program, which requires chefs to buy at least 20 percent of their ingredients from small farmers, ranchers, fishermen, and food producers within 150 miles of their kitchens. The Wesleyan Food Co-op also helps feed the need for fresh local fare on campus, by allowing Wesleyan students to use points from their meal plan to buy locally grown and produced foods from Farm to Fork partners, including Wesleyan’s own Long Lane Organic Farm (see page 3). With additional options to buy meat, eggs, tofu/seitan, granola, coffee, bread, preserves, and more, last year alone the program generated $200,000 in additional revenue, all of which was put back into the local food economy. MIYO: MAKE IT YOUR OWN. 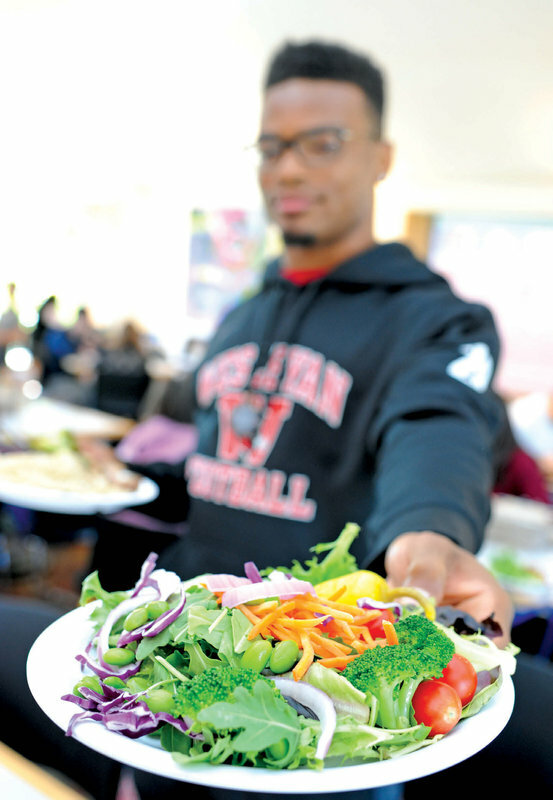 At Wesleyan, customization doesn’t stop at the salad bar: Students can put their own twist on everything from gourmet sandwiches at the Cardinal Deli, to an almost infinite variety of vegetable, protein, and starch combinations at the Mongolian Grill. The secret to customizable success: mixing in plenty of healthy options with the indulgent ones, and including a wide enough variety of flavors and textures to satisfy even the pickiest palates. In order to satisfy the hunger for plant-based food choices, the Marketplace at Usdan now offers a vegan/ vegetarian station with abundant vegan options for every meal, as well as daily house-made vegan desserts, including Stephanie’s Famous Apple Crisp (find the recipe online at magazine.wesleyan.edu). RISE & SHINE. All day breakfast is a hot trend on campuses across the country right now— and Wesleyan is no different. “Students keep irregular schedules, and all-day breakfast lets them eat whenever they’re starting—or sometimes finishing—their days,” says Strumpf. In the future, Strumpf hopes to expand breakfast at Wesleyan to include more international fare alongside traditional American bacon and eggs options. “Wesleyan has students from around the world, and we should be embracing culinary traditions from all parts of the globe at every meal,” says Strumpf. HAND IN GARDENING GLOVE. At Wesleyan, sustainability goes hand in gardening glove with local food sourcing. 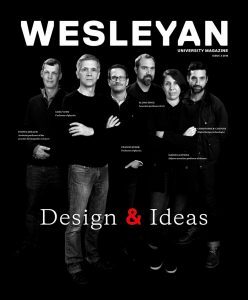 “Between dining halls and residential collection, last year Wesleyan generated 40 tons of food scraps,” says Jennifer Kleindienst, Wesleyan’s sustainability director. Food waste from student residences and participating offices is collected and composted in two Earth Tub composting units at Long Lane Organic Farm, where it is used, while dining hall compost is taken o.-site by Blue Earth Compost, a food scrap pickup service based in West Hartford, Conn. In addition, the Office of Community Service’s Wesleyan Food Rescue team collects unserved but still good-to-eat food six days a week from Wesleyan dining halls to share with Eddy Shelter, a local emergency homeless shelter for single adult men and women that relies exclusively on the service to feed its residents.